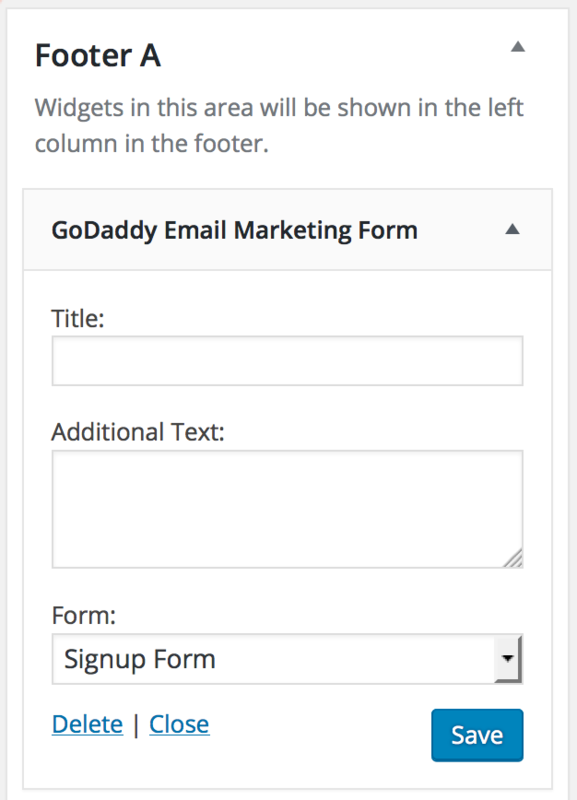 Once you've set up the GoDaddy Email Marketing Signup Forms plugin, and edited your signup form to your liking, you're ready to put the signup form on your WordPress site. You can do this using a widget or a shortcode. Note: If you used the setup wizard to create your WordPress site, your default signup form is already added to your site, as a widget. Follow the widget instructions to make any changes to the display text, or which form is used. If you don't see the form added to your sidebar or footer, follow the widget instructions to add it. From your WordPress Dashboard, hover over Appearance, and select Widgets. Under Available Widgets, find GoDaddy Email Marketing. Drag it over to the right, into whatever area of your site you want the form. The form panel should expand to show options. If you want to give your form a title, enter it in the Title field. You can enter Additional Text, as well, to display underneath the title, and above the form. Under Form, select the signup form you want to use. From your WordPress Dashboard, hover over Settings, and select GoDaddy Email Marketing. Next to the form you want to use, all the way to the right, click (the clipboard) to copy the shortcode. Go to whatever post or page you want to put the email signup form in, and paste the shortcode directly into the WordPress composer. Save your post or page, and when you preview, you will see the form where you placed it. You can read more about using shortcodes, here. If you have an Up & Running or Pro account, you can set up an automated welcome email for all your new subscribers. If you have a Beginner or Starter account, you can still compose and send a regular email to your subscribers.